All those who want to commit to pray for a year (possibly three in the afternoon) the Chaplet of Divine Mercy, at the invitation of John Paul II to be apostles of Divine Mercy and in response to the call of Our Lady Queen of Peace ", can fill out the form below with your information and send it. The signatories to this initiative are already more than 10,000, located throughout Italy. The Sons of Divine Love Association will pray for the intentions of all its members every day in communal prayer and the fifth of each month (day of death of St. Faustina) will celebrate the Holy Father Francis Mass for the intentions of all the apostles of Divine Mercy. Membership is completely free to members and the data will be inserted in a file kept by Fr. Francis. 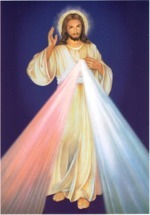 I, the undersigned, through this membership, I pledge to pray the Chaplet of Divine Mercy for an entire year. Privacy: personal data communicated in this form are treated in accordance with art. 13 of Legislative Decree no. 30/06/03, No 196 "Code for the protection of personal data" and will be used only for the delivery of services required. They can not be disclosed to third parties for any reason.